Remember our Best Edu Websites contest? As promised, we’ve looked through all educational sites in the Irish Internet country and selected the Best 10. 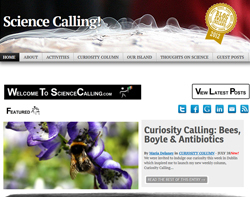 You can trust these sites to bring you the best education-related content in the Irish Web! 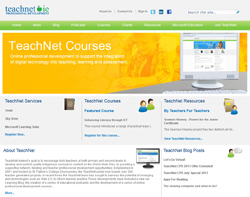 Teach Net - http://www.teachnet.ie/ - looking for enhancing your classes with the use of IT? It’s possible with a few clicks of the mouse. Teach Net is a website that offers professional courses that show how to implement technology in teaching. Also, it contains a huge how-to advice column which provides tips on using computers for educational purposes. Why we chose it: the website aggregates lots of courses on how to combine IT with teaching in one place. 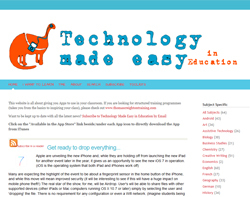 Tmadeeasy - http://www.tmadeeasy.com/ - we’re so weaned on technology and it should not come as a surprise that it knocks on the schools’ doors. Technology Made Easy contains tons of useful tips on how to use the latest tech gadget for education. Well, kids today certainly love technology more than books, so why not? Why we chose it: whether we like it or not, technology is everywhere and classroom is no exception. It’s a great idea to show how to use it for educational purposes. 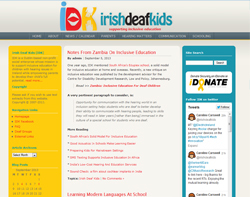 Irish Deaf Kids - http://www.irishdeafkids.ie/ - as the name suggests, it is a website devoted to students with hearing issues. The authors share their knowledge on how to educate deaf kids and provide learning materials. Why we chose it: one of the very few websites that is aimed at disadvantaged students and lets them acquire top-notch education. Anseo.net - http://www.anseo.net/ - one of the most important places to visit if you’re a teacher. The authors share their comments on the latest education-related events. This means, it’s a huge source of inspiration because you may see the same thing from different angles. 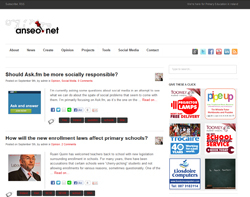 Why we chose it: Anseo is like a daily newspaper focuses solely on education. The scope of topics they cover is really wide, so it’s like a one-stop resource where you can get anything you need. 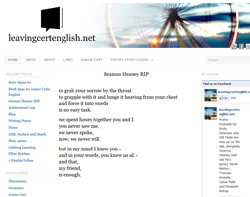 Leaving Cert English - http://leavingcertenglish.net/ - another author that posts comprehensive notes on the Web. The site is run by a secondary school teacher who shares her tips on how to prepare for the Leaving Certificate. Why we chose it: it’s a fabulous idea for a teacher to make a site like this, as students may get a bit into, so to say, the backstage. Why we chose it: keeping up-to-date with scientific discoveries is essential for understanding the world. Big plus for Maria for presenting it in a way that sounds like a casual conversation over coffee. Why we chose it: the authors are doing a great job spreading the word on how to handle an exceptionally able kid. Fantastic idea! Keep on the good work, as we need more Irish Nobel Prize laureates! 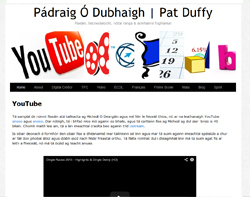 Pat Duffy - http://pdu.ie/ - another great source of materials for IT teaching and French. The site is in Irish which makes it stand out from the crowd. Content-wise, though, Pat Duffy provides really nice stuff. And you can get some really helpful software, as they give a chance to download something for free everyday. Why we chose it: a great resource of professional teaching materials on a variety of subjects. 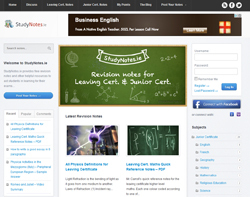 Study Notes - http://studynotes.ie/ - a great and comprehensive resource for students looking for knowledge. Looks like an online notes library. A great one-stop point for any student that needs revising before the exams. It contains sample exam questions and covers the most basic topics from almost every subject taught in Irish schools. In addition, the materials posted on Study Notes are often prepared by professional educators which ensures high quality. Why we chose them: Study Notes covers almost all subjects and presents it in a clear way. 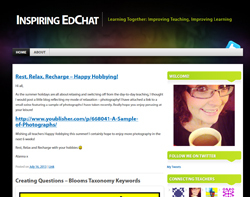 Inspiringedchat - http://inspiringedchat.wordpress.com/ - not a large source of knowledge, but a blog. The author shares her ideas on how to become an inspiring teacher. Seems that this website will make a great read for every tutor looking for some fresh ideas. Why we chose it: no matter if you’re an experienced teacher or just a newbie, Inspiringedchat gives lots of positive energy into your teaching.